Charles Rolls and Tim Warrillow say the upcoming IPO is exactly what they wanted. 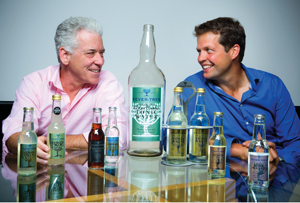 Fever-Tree is putting some fizz back into the IPO market with a £154.4m float on London’s AIM market, and unsurprisingly the posh mixer maker’s founders are pretty enthusiastic about it (and their upcoming payday). ‘It’s exactly the result we wanted,’ co-founder and executive deputy chairman Charles Rolls told MT. ‘It’s exciting to have a book very well covered despite the market conditions,’ fellow founder and chief exec Tim Warrillow added, referring to choppy stock markets that prompted companies including challenger bank Aldermore to pull planned flotations. The float will raise a total of £93.3m, but only £3m is going back into the company after £1m in fees are paid out to advisers (including the sole bookerunner Investec). Private equity backer LDC, which bought in last March when Fever-Tree was valued at just £48m, is selling off just over 80% of its majority stake, leaving it with a 10.3% holding. Rolls and Warrillow will net £17.3m and £7.6m respectively from selling off 40% each of their 28.7% and 12.7% stakes. Both are holding onto their roles in the company and said they’re in it for the ‘long-term’ - not entirely going back on their words from less than two months ago, when they told MT it was a ‘terrible tragedy so many UK businesses sell out so soon’. The company, which has since branched out into other similarly middle-class mixers such as ginger ale and elderflower tonic, posted revenues up 44% to £23.3m in 2013, while EBITDA ‘before additional items’ jumped 72% to £6.7m. It now sells to 50 countries, with 70% of revenues coming from abroad and almost a quarter from the hard-to-crack US.